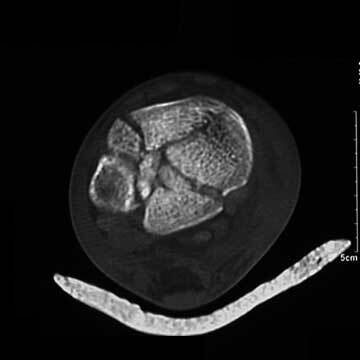 Pilon fractures are fractures involving the articular weight bearing surface of the distal tibia. Evaluate Soft tissues. Open fracture classification. Soft tissues injuries are classified according to Tscherne and Gotzen. Open fracture classified per Gustilo and Anderson. Treatment: initial fixation of the fibula with temporary spanning external fixation with delayed conversion to internal fixation when soft tissues permit, generally 14-21 days. CT scan should be performed in traction for pre-op planning. See Pilon ORIF / Ex Fix Technique. 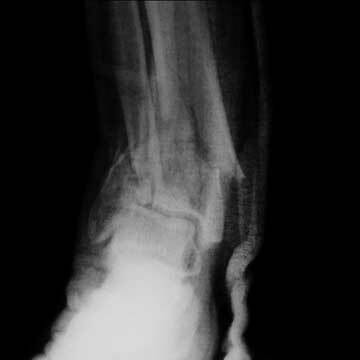 Closed fractures may be placed in calcaneal traction and a Bohler-Braun frame. Ruedi Allgower Classification (Ruedi TP, Allgower M CORR 1979;138:105). Reudi-Allgower Classification: Type I & II = 86% excellent to good results nonuniomn =7%, malunion=3%, wound dehiscence=17% Type II&III high energy=wound problems and deep infection uto 37%, malunion=23%, nonunion=27%. Tscherne grades 0 or 1 best treated with AO/ASIF technique plating, femoral distractor often helpful for indirect reduction. Tsherne 2 & 3 and open fx best treated with limited open fixation(olive wires/canulated screws) for articular reduction and small wire circular external fixation. 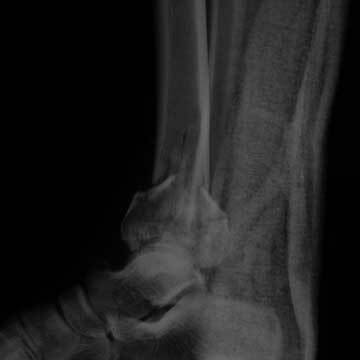 nonweightbearing at least 6wks generally 12 weeks., Ankle and subtalar ROM exercises. external fixation = early ROM exercises, WB advanced at 6wks, FWB before removal, dynamize 1-2 wks before removal. Average fixator time is 15wks. 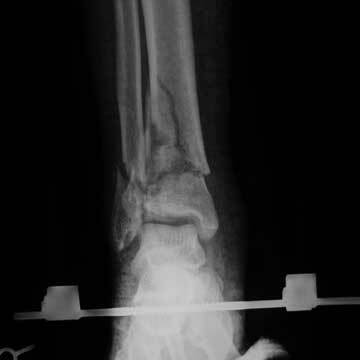 Cast for 1-2wks after fixator removal. Patterson MJ, Cole JD. Two-staged delayed open reduction and internal fixation of severe pilon fractures. J Orthop Trauma. 1999 Feb;13(2):85-91. Tsherne H, Gotzen L: Fractures with Soft Tissue Injuries. Monograph 1-58. Berlin, Springer-Verlag 1984. Leone VJ, Ruland RT, Meinhard BP: The management of the soft tissues in pilon fractures. Clin Orthop 1993;292:315-320. Wyrsch B, McFerran MA, McAndrew M, et al: Operative treatment of fractures of the tibial plafond: A randomized, prospective study. J Bone Joint Surg 1996;78A:1646-1657.